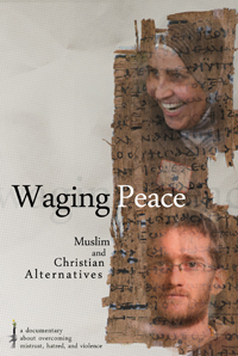 The one-hour documentary, Waging Peace: Muslim and Christian Alternatives, is scheduled for broadcasting beginning June 23 on NBC-TV. The program examines courageous threads of peace quietly being sown around the world and will air at the discretion of local NBC affiliates through November 2013. The program first aired on ABC-TV in the fall of 2011 through the Interfaith Broadcasting Coalition, of which the Islamic Society of North America is a member. A wide variety of persons add their perspectives in the documentary, including David W. Shenk, author of A Muslim and Christian in Dialogue; Peggy Gish, Church of the Brethren peace and social justice activist; Lynne Hybels, of Willow Creek Community Church; Martin Marty, church historian and longtime columnist for Christian Century; Sami Rasouli, director of Muslim Peacemaker Teams in Iraq; Jihad Turk, director of religious affairs at the Islamic Center of Southern California; Najeeba Syeed-Miller, assistant professor of interreligious education at Claremont School of Theology; and J. E. Rash, Muslim scholar, president and founder of Legacy International and a lecturer, writer, and consultant in conflict resolution. Check local listings to find when it is being shown in your area! A list of stations planning to air the program is at www.interfaithbroadcasting.com.